Transferring files from Mac to iPhone with iTunes sometimes can be a little bit annoying. As we know, the iTunes app is a very encrypted app which is simulated to be strictly used. Most Mac users may have stored a lot of files on their Mac, but it is inconvenient to take the Mac with them everywhere. So if you are in need of the very complications of transferring your files from Mac to iPhone, this article provides you with top ways to transfer without the use of your iTunes. Transferring files between your Mac OS and your iPhone can come easily with the use of iTunes. iTunes installed on your Mac allows you to transfer a limited collection of media files. However, using iTunes to sync Mac files on your iPhone will inevitably result in data synchronization on your iPhone. To ease the transfer process, it is better to update iTunes on your Mac to its latest version to avoid issues such as "iPhone does not connect to iTunes". Go to the App Store > Updates and your Mac will automatically check for updates. If a new version of iTunes or Mac OS is available, click to install and update your iTunes to the latest version. Step 1: Connect your iPhone to Mac with a USB cable. If it does not open automatically, you need launch iTunes. Step 2: Tap the Device button and choose Photos. Step 3: Tick the box next to Sync Photos. Then scroll the Copy Photos drop-down menu and choose your selection. 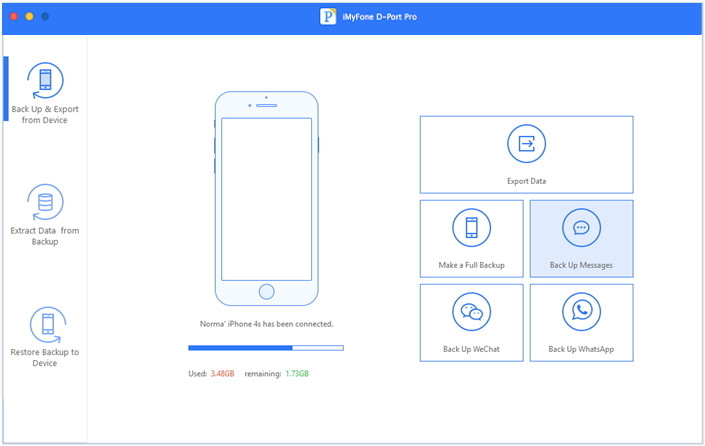 Step 4: Tap Sync to start importing Mac photos to your iPhone. As earlier said, syncing your data files from your Mac to your iPhone can be really tasking when you have to use iTunes. That means you have to use your data which results to the extra cost. But you can cut away the annoying things while using iTunes. D-Port Pro will help you to copy your files to avoid syncing and allows you to even copy wirelessly. It is the best software available for transferring your files from Mac to iPhone with ease. Here are few reasons why using iTunes can be so much pain. 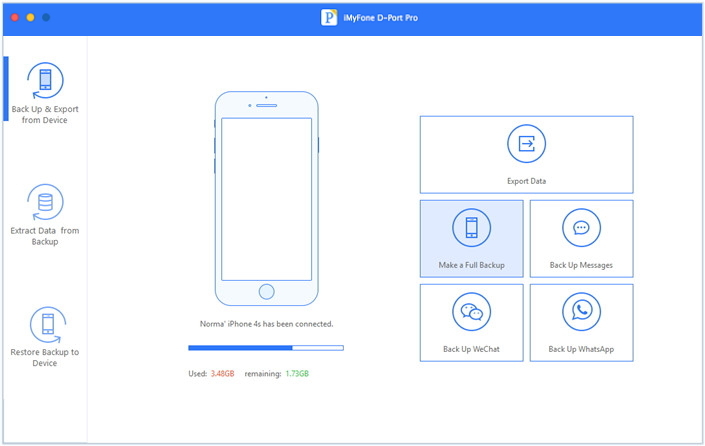 iMyFone D-Port Pro is an extractor and developer of backups designed for the iPhone, iPad and iPod touch. It is a desktop utility and is compatible with Mac and Windows operating systems. It is compatible with most iOS devices, including iPhone 8/8 + and iPhone X, and all modern iOS versions like iOS 11.3. 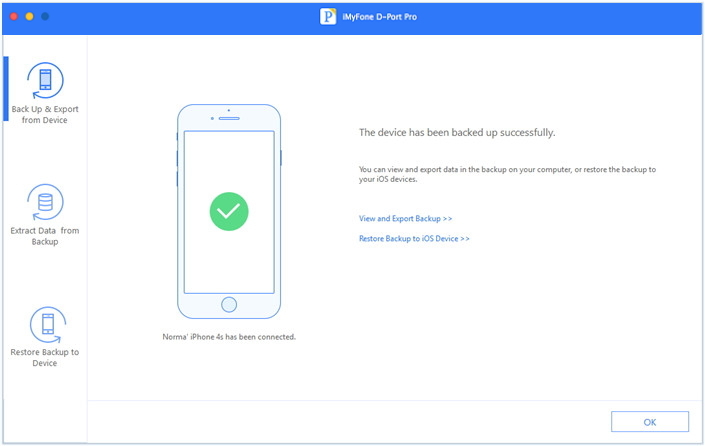 Export and save data from iDevices/iTunes backup/iCloud backup. 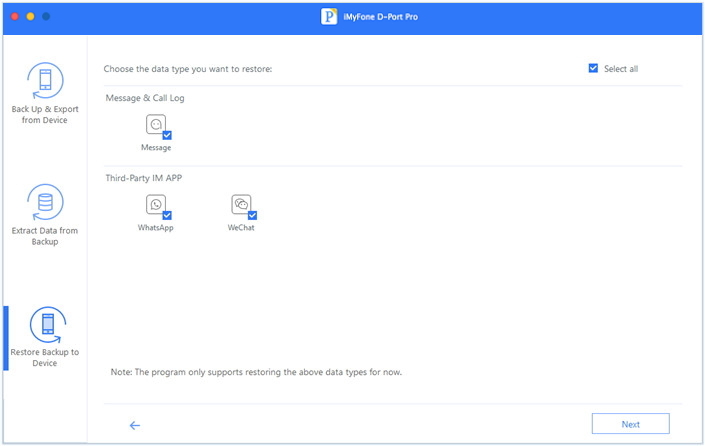 Only back up and restore data related to Messages, WhatsApp, WeChat. Step 1. 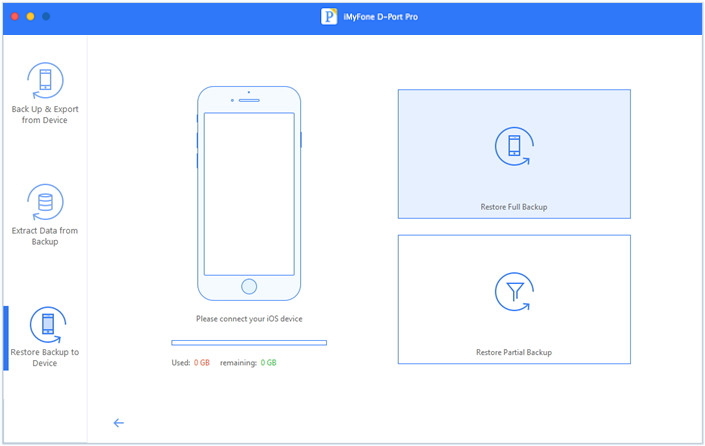 In the left pane, select Backup and Export from Device, and then click Make a Full Backup. Step 2. On the next screen, click Save to continue, and the program will begin the backup process. Please do not disconnect the device during the process. Step 3. Once the process is complete, you will be informed that the device has been saved successfully. You can view and extract data from the backup or restore the device later from the backup. Step 1. In the left pane, select Back Up & Export from Device, and then click Messages/WhatsApp/WeChat Backup. Step 3. 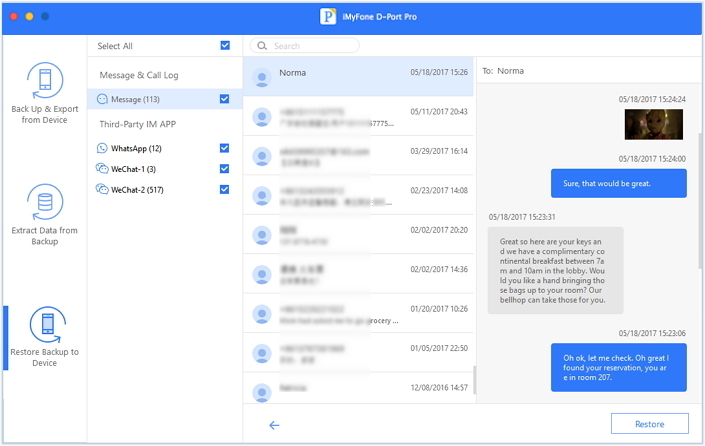 Once the process is complete, you will be notified that your Messages/WhatsApp/WeChat data has been saved successfully. 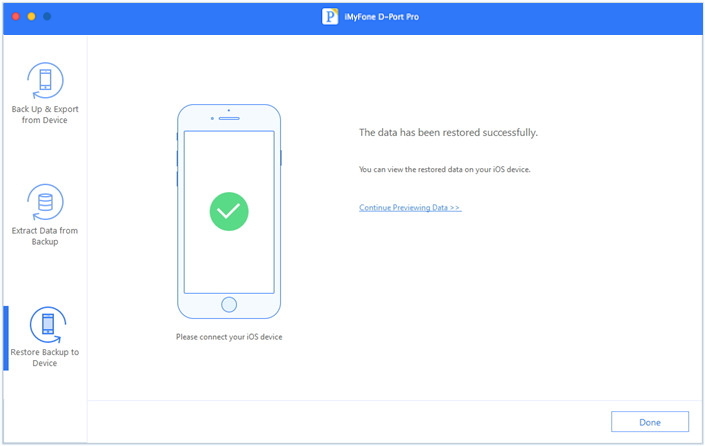 Then you ou can view and extract data from the backup or restore the device for future use. Step 1. Select Restore Full Backup. If your device is not connected, the program will prompt you to connect. Now follow the instructions on the screen. Step 2. After recognized, the program will show you some warnings. 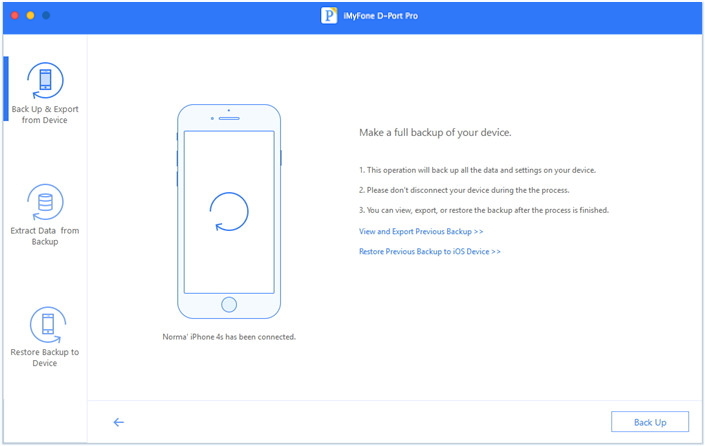 If you want to restore the full backup with replacing all the data and settings on your device, just click Next to start the process. Step 3. 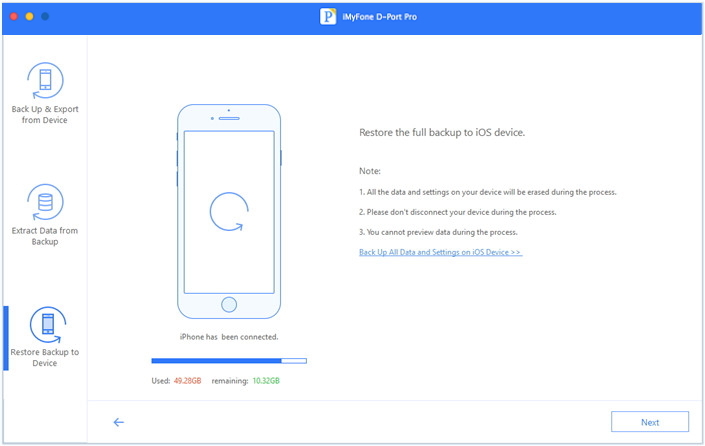 The program will take some time to restore the full backup to your iOS device. Do not disconnect your iPhone during the entire process. After the process, you can see the restored data on your iOS device. Step 1. Choose one backup and click the Restore Partial Backup option. Then click Next. It will prompt you to select the types of data you want to restore. Step 2. Click Next to let the program analyze the backup. After scanning for a moment, you can preview the selected data types. Step 3. Select the data types that you want to restore, and then click Restore. The program starts restoring the data without affecting the other data on your device. iTunes obviously has its usefulness but D-Port Pro is really a good alternative of iTunes. Follow the above ways to take your important data with you from Mac to your iPhone. Do not hesitate to have a try and feel free to leave comments below.